As it is National Poetry Day I am putting a Kathleen Raine poem Exile on my blog, which I read in Victor Gallancz very personal anthology of writings From Darkness to Light. She was a wonderful writer, I think amongst the finest British poets. I do not share her beliefs, but she had the ability to express hers in words which are so spare, where no word is unnecessary. On to another ﬂower, opening its entity. Proclaim I AM, and remains nameless. 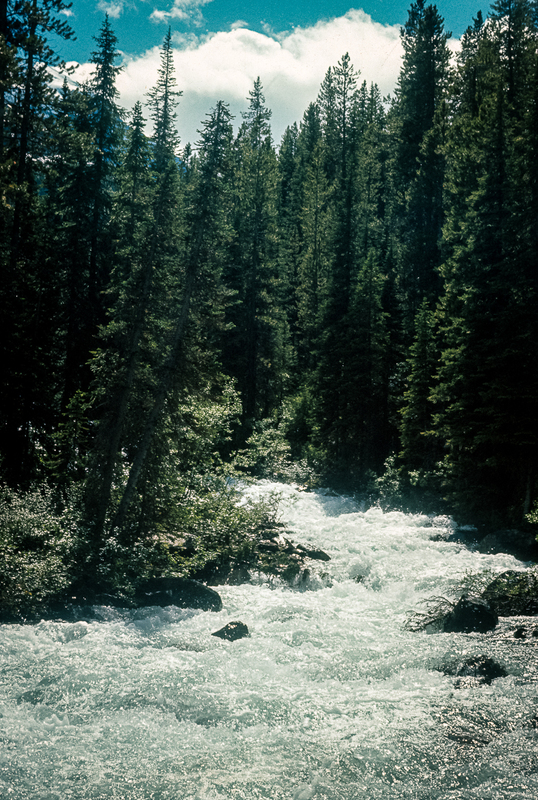 Today’s photograph is from 1972 in the Rockies in Alberta, quite opposite really to the poem but an image I must have wanted to capture at the time, the freezing cold water tumbling down from the mountains and tall pines. It was taken on my Zenith on Ektachrome.